We’re keeping it quick and simple today, friends. 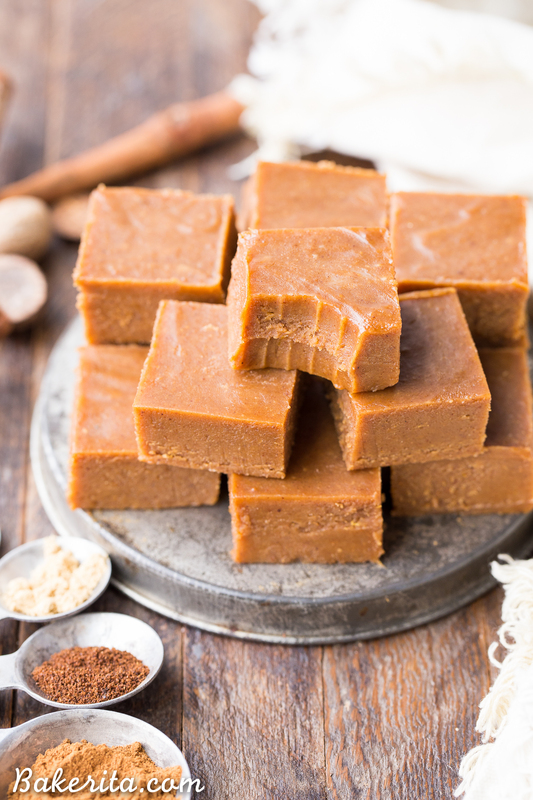 This Pumpkin Spice Fudge recipe is one that requires just a few ingredients for maximum flavor and deliciousness – those recipes are the best kind, right?! Little effort + few ingredients = SUPER delicious treat?! That’s the kind of math that even I can get behind ;) and if you’re basking and reveling in all the pumpkin spice amazingness that is flooding our feeds and grocery stores, you’ll be extra excited about this pumpkin spiced goodness. 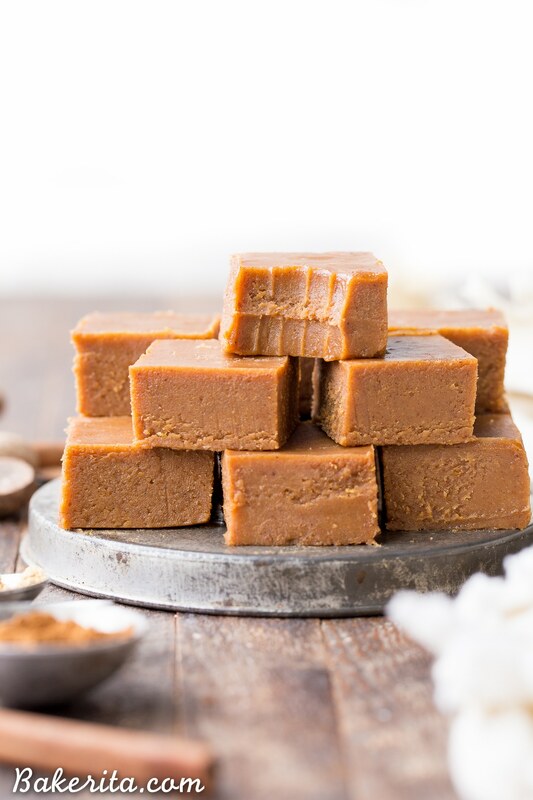 This pumpkin spice fudge is made up of five key ingredients that make it so super delicious and give it that amazing, melt in your mouth texture. Let’s chat about them and why they’re here, shall we? Next up: nut butter. 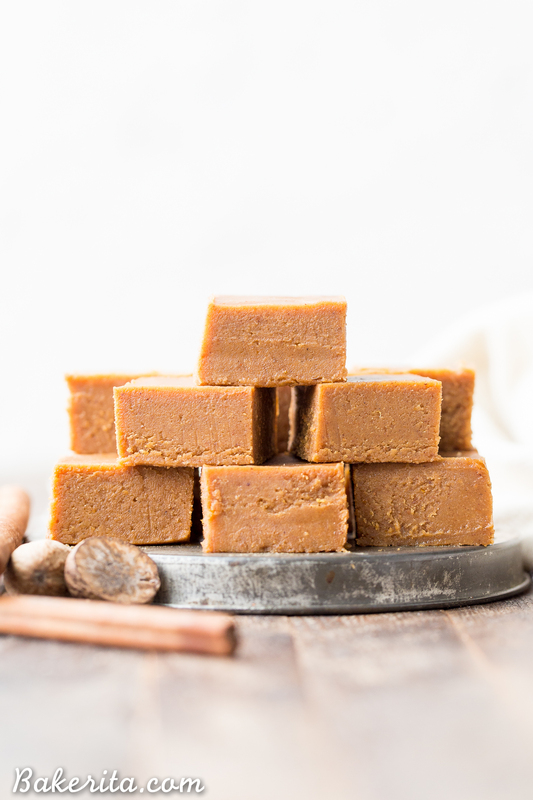 I used cashew butter in this recipe, because I love the buttery richness of it in contrast with the pumpkin and spices. You can use whatever nut butter you’d like though – I’d recommend almond butter next. Just make sure it’s 100% nut butter, and doesn’t have sweeteners or any weird ingredients added. 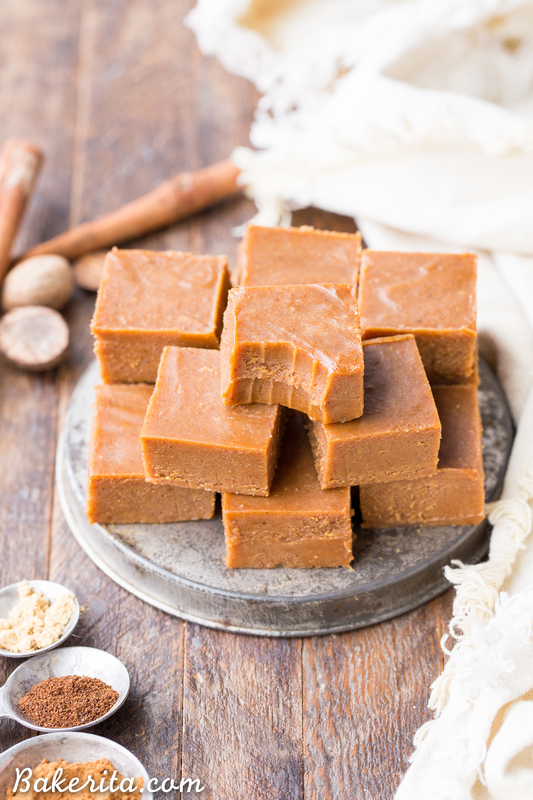 Of course, you’ve got to have organic pumpkin puree – make sure it’s not canned pumpkin pie filling, which is already full of sweeteners and spices. We’re adding our own dose of pumpkin spice to the mix! To sweeten, I used maple syrup. I love the way the maple flavor pairs with the warm pumpkin spices and the pumpkin. After that, we’re got some optional vanilla extract and salt, to taste, and that’s all! The ingredients are just whisked together until smooth, poured into a pan, and put into the fridge to set. 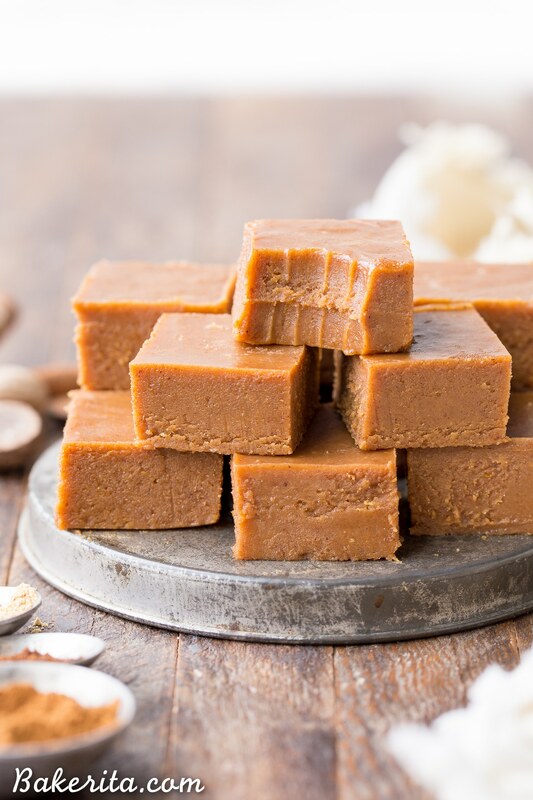 The resulting pumpkin spice fudge couldn’t be easier to make, and all the deliciously rich pumpkin spice flavors absolutely melt in your mouth, leaving you with a burst of warm cinnamon, spicy nutmeg, creamy cashew butter, and sweet maple. I hope you love these!